This allows you to study the motion of objects such as a person walking, a ball in free fall, or a cart on a ramp. Our redesigned Motion Detector can measure objects as close as 15 cm to the detector and as far away as 6 m. The short minimum target distance allows objects to get closer to the detector, which reduces stray reflections. A special Track mode switch tailors the sensitivity for dynamics carts on tracks for lower noise and higher quality data. 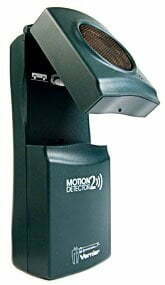 The Motion Detector attaches easily to the Vernier Dynamics Track, and has a pivoting head and rubber feet for ease of use when not attached to a dynamics track. The cable is removable, so you can use the Motion Detector with other interfaces with a separate cable. For LabQuest Mini, LabQuest, SensorDAQ, CBL 2, and LabPro.